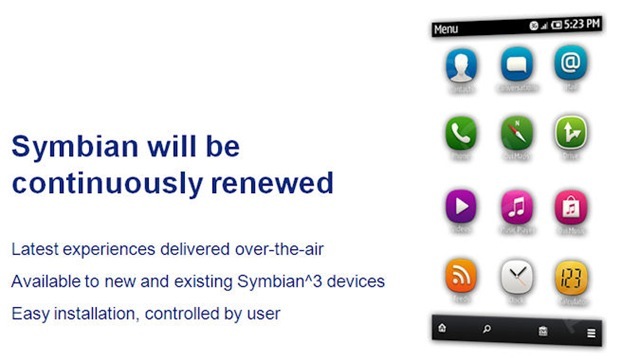 Layman’s take – Symbian PR3.0 teaser-the radical changes? Note: Wait! wait! Wait! if you are reading it for some exclusive things that you have not seen on web yet, then please stop here as its the same stuff that has been posted by MyNokiaBlog etc. Here I am just going to discuss some of the finer details on it. So, after the note of caution, let me start with some old speculations around the next gen Symbian updates that were being called as Symbian^4 earlier but with the arrival of Stephen Elop, a lot of things got changed internally and the decision of dropping the name Symbian^4 was one of them. All the scheduled changes were going to be part of existing Symbian^3 itself in iterations and that’s how PR3.0 became something very radical than anything before. Recently we seen some previews of PR3.0 a.k.a. radical changes in slide from Nokia itself and the teaser itself given a lot of hints about the coming UI, which made me to post a few comments about them. This was one of the complaints that many like Symbian-Guru made that the top bar in Symbian UI was taking almost double of precious screen space than its competitors. 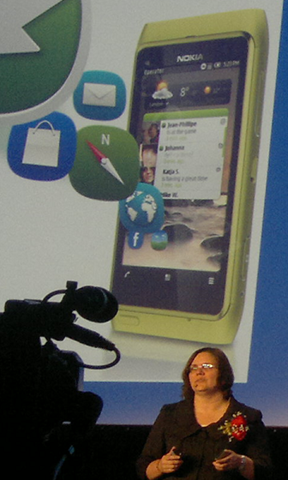 Symbian was using bigger top bar to use them as interfaces to go into connection settings, calendar, profiles etc, but other platforms proven that the big bar wasn’t needed. But the same time, another frustration of users came out with Menu-under-menu system, when it was more text centric than being visual like other platforms. You can see that in place of making use of hardware menu button there is a “Menu” text on the left top, most probably to get aligned with MeeGo UI, which was supposed to come without hardware menu buttons most probably. The bottom UI, which is supposed to replace two button layout in all the places, has four icons: first Home, second Search, fourth Options and third one is the mysterious one that might be link to Tile UI on home screen or screen snap kind of thing to restore the visual settings of the opened page. Its good to see that Nokia finally removing bulky looking 3D kind of button UI now, but I am still wondering if they will proceed with similar changes to the touch keyboard as well? Note that this bottom menu will be contextual means not the same layout at all the place, like you can see in above picture that is snapshot of the home screen with one Call Button on left, one options button on right and in center again a mysterious icon. Not sure, if users were looking for new icons at all, but there were some comments like this when Symbian^3 was launched. “Oh! No!! again the same age old icons?” I guess Nokia just trying to address the same. Interesting is to see icon for “Phone” and a direct link to RSS feeds though I am still wondering that why they were needed to have two different icons for Navigations and maps? Much more tighter Ovi Maps integration coming? 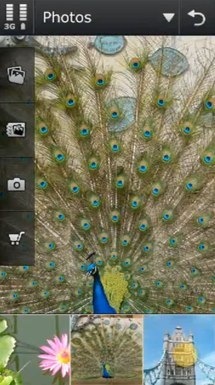 Most likely we will see background customizations too and whole UI is supposed to be more and more portrait oriented. Though one shouldn’t take much hints from the slides like this, but like we see the already discussed top and bottom layout here, there is also a much bigger social widget (if really part of home screen), not only that but we see green icons in the right side, probably to show the status of the contact or just service (ovi, facebook, google). Though this is not exactly what been speculated once with a concept video (link here), but still it will be interesting to see if with Qt, the Social Client of Nokia N8 could actually become favorite of world? There will be a flexible widget system where the size of widgets wont be fixed only and we will see much more options with them than just being used as link to full apps only. Much more options for developer’s intuitiveness. Though above are much old screenshots of concept UI, but the plans seem to be delivering much similar to this. We already have received 3 photos in a row interface with PR1.1, all remains is to deliver the sliding navigation like the second screenshot above. 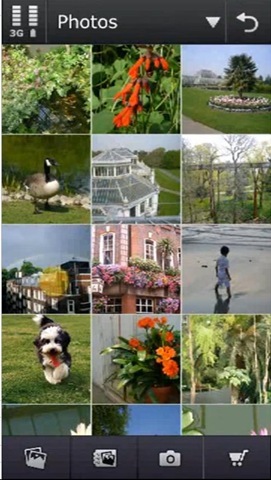 As Nokia already taken much of bashing over Flickr/ Picasa integration etc, so unlikely they will do the same mistake again and again. Personally I can’t wait to get social integration beyond the levels of Android or Maemo even. I already discussed a few things related to the upcoming browser before and its notable that the browser is not carrying the same bottom or top layout at least as of now. May be will change in future with PR3.0, but personally I feel that having the same top bar would be better so that one is always aware of battery and connection status and so of time. While considering the success with microB browser of Maemo, I could really expect Nokia to do good with the inside browser tech that is sure gonna be HTML 5 compatible, what I am more looking for the visible bookmark icons like other platforms (better not live, but on the basis of last opened status). This is something that continuous scaring me. 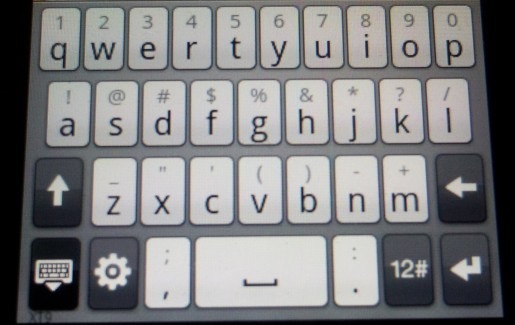 With the latest rumors, the keyboard layout seems to be like the above, which is again not a glossy or lighter one. Moreover, after choosing the 16:9 layout among its all Symbian^3 devices, they already left with a smaller width that will always translate to small keys. But most importantly as of now, the split keyboard coming with PR2.0, doesn’t seems to be context sensitive like the one given below (Android, HTC), something that Nokia needs to work out before PR3.0. While I can understand that with not that many pixels available for buttons, its not possible to put double icons like shown in above, but intelligent offering of layout might be more intuitive than choosing a fixed layout for all the apps. For example: While typing a SMS\ Mail, ‘@’ might not be that important but while typing a email address in To/ CC or typing a twitter update, you can’t live with one. With the fixed layout as leaked, they seem to be following similar path as iOS, but I think Android one was more richer. So, this was some of my opinions about the upcoming updates that will be delivered over the air as PR3.0 at sometime in October 2011 or later. These are just a few of likely changes and there are many other changes that will make those 50+ improvements. Tell me what you think about these? 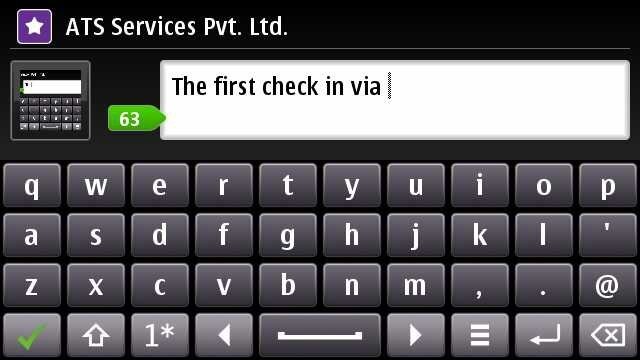 What more you want to see in Symbian? portrait qwerty keypad is not looking great as like android.look for it should be completely changed with graphics use.Also the voice commands should be made like own voice as like in own voice navigation.because voice commands are are not making the correct sense and opening of right application.so voice commands should be adapted as users voice as one time input of user voice as default. Having a 16:9 display gives a little space for the keyboard to have reasonable innovation on 3.5″, moreover the preview I shown here is not final yet. Remember, the portrait input also coming with Swype as an option (can be used/ not used without restarting phone). Very good news for Sumbian lovers? Is this update is comaptible for application installed in it? Yup! No issue with that as till then most of the app developers will update their apps to Qt versions. But why is the background white? Thats a demo slide not the actual implementation and I already commented that it might be sign of background customization option everywhere. how many home screens in the new update ? Well! the concept of the home screen will be a little different. But you have to wait till October at least. any news on bookmark icons? So you can tell the difference between them.